Halloween this year will be the 500th anniversary of an important day in social networking and viral communications history. A week later, we’ll celebrate a less momentous milestone in Mayo Clinic’s social media history. On Oct. 31, 1517, Martin Luther nailed his Disputation on the Power and Efficacy of Indulgences to the church door in Wittenberg, Germany. Originally intended for the clergy and written in Latin, the document was translated into German by January of 1518. Then it went viral, thanks to Johannes Gutenberg’s communications innovation of just a few decades earlier, the movable-type printing press. Luther’s 95 Theses, as they came to be called, spread throughout Germany in two weeks and throughout Europe in two months, igniting the Protestant Reformation. November 7, 2017 will mark the tenth anniversary of Mayo Clinic establishing its first Facebook page. While our Facebook Decennial is insignificant compared with Luther’s Semi-Millennial, it’s interesting to look back on all that has changed in health care communications since then. For a few years after we started on Facebook, many felt it odd that an organization as long established and well-respected as Mayo Clinic would become involved in a platform that had previously been the province of college students. That feeling was fueled by twin misunderstandings: of the history and values of Mayo Clinic, and of the fundamental nature of social media. For several years, I have asserted in my presentations that social networking is part of Mayo Clinic’s cultural DNA, dating back to the examples of our founders, Drs. William and Charles Mayo. From that perspective, Mayo Clinic’s involvement in social media – digitally enabled and amplified social networking – was perfectly natural. As I participated in a series of lectures in China last year with Kent Seltman, our former Marketing Division chair and the co-author of Management Lessons from Mayo Clinic, I realized deeper levels of meaning in that DNA metaphor. DNA has two strands and is comprised of four bases. I believe Mayo Clinic’s cultural DNA likewise contains essential elements bound by two powerful themes. 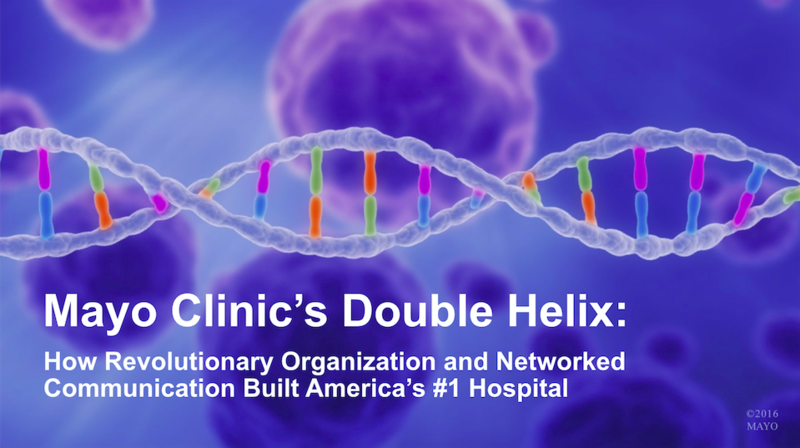 So today I’m starting a blog series called Mayo Clinic’s Double Helix: How Revolutionary Organization and Networked Communication Built America’s #1 Hospital. I had considered developing this thesis in book form, along the lines of The Doctors Mayo and Management Lessons from Mayo Clinic. But it seemed more fitting, given the subject matter, to do it here. So between now and the two anniversaries coming this fall, I plan to publish posts in this series, gathering them on this landing page for those interested in reading them sequentially. I hope colleagues working in other health care organizations will find inspiration in this series to more fully embrace the opportunities we have to use these revolutionary tools for the benefit of patients everywhere. We have many resources (including the Kindle version of Bringing the Social Media Revolution to Health Care) available at no cost through our free Basic Membership in the Mayo Clinic Social Media Network. For those wanting to go deeper, we have both Individual and Organizational Premium membership options, too. For my fellow Mayo Clinic employees, I hope Mayo Clinic's Double Helix renews your appreciation for the special organization for which we work, and the privilege we have to follow in the footsteps and build upon the legacy of so many who have gone before us. I trust it also will help you see social media in a new way, as immensely powerful and effective communications tools we can and should use to better serve patients and society, in keeping with our Mayo Clinic values and heritage. Lee Aase is a Communications Director for Mayo Clinic's Social & Digital Innovation team and is Director of the Mayo Clinic Social Media Network. 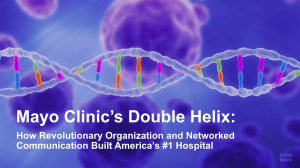 This post is part of a year-long series called Mayo Clinic's Double Helix: How Revolutionary Organization and Networked Communication Built America's #1 Hospital.